Our wishes came true, eventually. 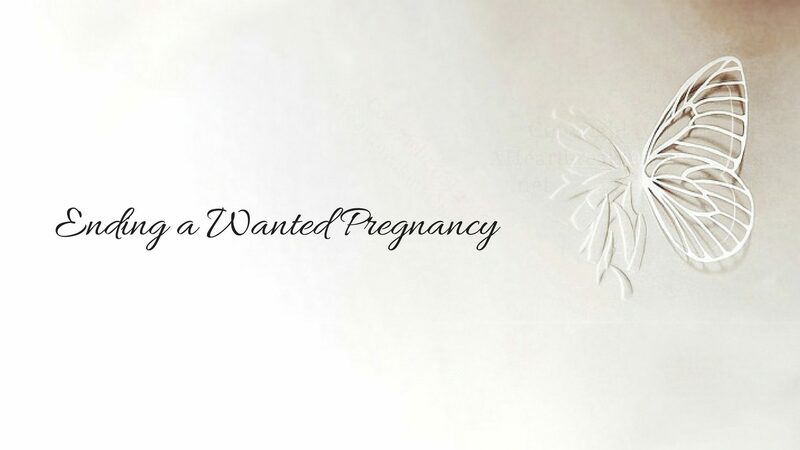 It was a full six weeks after making ending my wanted pregnancy before I had even a glimpse of feeling normal. My loss was in February, 2000 after learning that my baby had irreparable heart defects and Down syndrome. I had found the support website, but it took me until April to screw up my courage and share my story with strangers via the old Yahoo listserv, where our grief support group was at that time. That was when my healing actually began. The time before that was like being at the bottom of an ocean of grief. I carried a dishtowel with me to mop up the tears that sprang out every time the Teletubbies baby appeared on TV or a pregnant woman happened by. I clung to my husband and toddler daughter through those first weeks and waited for time to separate me, if only just a little, from my tragedy. I felt like a complete failure. Two years earlier, I had left a satisfying career to stay home with my then one-year-old daughter and attend graduate school. I wanted a second baby and just couldn’t imagine taking another newborn to daycare, as my job had demanded with my first. Now my daughter was approaching age three and we’d lost our baby. Because of the emotional stress and the medical and funeral expenses involved, I had to drop out of my graduate courses. I was rudderless and could not see where my life was going. When I first joined the old listserv, what helped the most was the encouragement from other mothers whose losses were years, months or in some cases only weeks ahead of my own. They offered hope and words of hard-earned wisdom. They offered advice for getting through the tough times: the anniversaries and due dates, the dealing with other people’s pregnancies and births, the insomnia and nightmares, the spiritual dilemmas. They offered the kind of sympathy, empathy and practical advice that can only come from those who have been there before you. I learned that I was not alone in my exquisite grief. I learned that some people’s losses were even harder than my own. Many had never experienced a successful pregnancy. Some faced termination after years of infertility treatments. Some did not have supportive families or husbands. A few had lost twins. Some learned that they had as high as a one-in-four chance of conceiving another baby with the same defect. A couple of mothers had even been faced with making heartbreaking choices more than once. Reading their stories precipitated a shift in my all-consuming grief. As depressing some of their stories seemed, they reminded me that I was not the unluckiest woman alive. As the others gradually went on to adopt or get pregnant, get good test results, and give birth to healthy babies I realized there was hope for me too. Gradually I moved from soaking up sympathy and advice to offering it to the newcomers. I’d made it through that early grief and because of that I had sympathy, support and war stories of my own to share with them. Nothing was more healing to me than being able to help others. We still wanted another child and seriously considered adoption, but after learning of the expenses involved and that our own risk for a recurrence was relatively low, we opted to try for another pregnancy. The following November I became pregnant again. This time was so different than the last two. There were no giddy announcements, only waiting with grim determination until I was far enough along to take the CVS. Unfortunately the test was at the very same hospital and with the very same doctor who had performed my termination. I dreaded going back there, but actually doing so made me realized that I had survived the nightmare. I really could scrape together the courage to face that place and that doctor once again. And I did. On the way down to the hospital, my husband and I heard a radio ad seriously proclaim “there is nothing worse than when your baby has a cold.” Every time things got a little too tense on that trip, one of us would deadpan that almost offensively naive statement. Our mocking of the ad gave us strength, because it reminded us that we’d we’d already made it through something more terrible than luckier parents would dare imagine. Our doctor refused to give us the faster FISH results, so we had to wait out the agonizing 12 days for the more reliable full karyotype report. On a Friday night when we still had not heard back, my husband called our genetic counselor and got the news. She told us we were expecting a chromosomaly normal baby, a boy. I could finally stop worrying about whether I was having a baby or an abortion, and start enjoying my pregnancy. The following summer I had an uncomplicated natural childbirth and welcomed my new baby into our family. It was such a relief to take him home with me. I don’t know how any mother can appreciate her newborn quite so much as one who has already lost a baby. One day when he was a few months old, we were in the car when he started to cry. Instead of feeling anxious or annoyed, I found tears of joy welling up in my eyes and exclaimed to my husband, “We had a baby! He is alive!” We both laughed and cried at our great good fortune, and in a few minutes were home and snuggling our fussy little bundle. As of this writing, he is a hardy, happy, affectionate and bright four-year-old who looks just like his father. Our family feels whole again, and we have learned not to sweat the small stuff. Every day I still think of the little baby that we lost and I know that if it wasn’t for our tragedy with him, our four-year-old son would not be here. All in all, I feel the loss has strengthened me as an individual. I know that I can go through emotional hell and eventually come out not just intact, but stronger than before. I know I can make and follow through on the right decision, even when doing so goes against every fiber of my being. It has made me less judgmental of others, yet at the same time more brave and vocal in standing up for what I think is right. It has also strengthened my marriage. Because of all we’ve been through, I know my husband is someone I can count on through even the most difficult of times. As we went through the worst of it, he held me and said that our little family was like an island, and that we were completely awash right now, but that eventually the waters would recede and we would still be here, and the sun would shine on us again. He was there for me every minute until it did. Our experience showed us that even when we’d lost all hope we could still maintain our dignity and our belief in one another. It has made me a better mother to both of my living children. I understand only too well how precious and delicate their lives are, and how lucky we are to have them. It also has made me more accepting of their little foibles and imperfections, because having faced so great a loss puts the inevitable minor crisis, accidents and illnesses into their proper perspective. It has also helped me figure out who my real friends were: those who have stuck by me, and even those friends I gained later who are able to accept my past without judgment. I find I have better, more open friendships now than ever before. Life is good now, even better than ever before. As long as you have the courage to work at it, to embrace the good and let go of the bad, and most of all to pursue your goals in spite of your fears, your life will be good again one day too. You can lean on and learn from those who have been there before you. Let them help you, and before you know it you may be the one offering comfort and advice to the newly bereaved.